Clue and Harry Potter, what could be better!! A “must have” for Harry Potter fans!!! Recommended ages are 9 years and up. This is an excellent family game!! Some say it is better than the original Clue game. 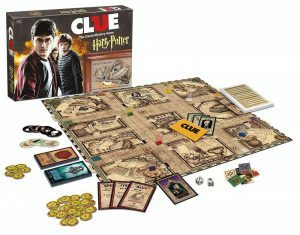 The object of the game is to solve the mystery of the disappearance of Hogwarts students. The game board features wheels which move the rooms and reveal secret passages!! That’s truly exciting!! This is excellent for Harry Potter Fans . . . and as a family game!! I found the book collection, a collectable quidditch set, a Harry Potter Collection Kindle Edition and the 8 DVDs. 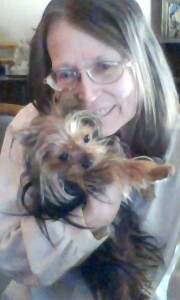 I do thank you for stopping by and shopping with me!! 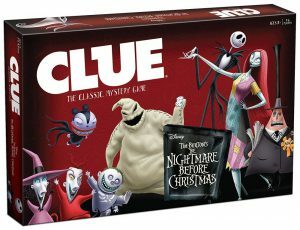 Clue: Tim Burton’s The Nightmare Before Christmas Board Game. The object of the game is all about saving Christmas! This is a delightful game for Tim Burton fans and fans of The Nightmare Before Christmas . . . and Clue fans. The six characters are: Jack, Sally, Oogle Boogle, Mayor, Dr. Finkelstein and Lock, Stock and Barrel. The six metal weapons include: bear trap frog’s breath, bathtub, zombie duck, present, Christmas wreath. This game is recommended for 8 years and up. It is a fun game . . . You may want to purchase the video along with the game to get into the spirit of things. I tried not to go overboard . . . this is your shopping list . . . not mine . . . I have friends who go to Disneyland regularly . . . to visit the Haunted Mansion . . . which is their absolute favorite . 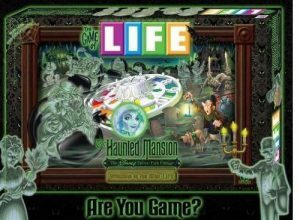 . .
Now, with this exclusive Game of Life Haunted Mansion Edition they can play this game between visits. This game is based on the original Game of Life with a spine chilling spin . . . So . . . this is basically welcoming player to the After-LIFE with its incorporation of the stories, history, mythology of the various theme parts with the Haunted Mansion attraction . . . Your playground is Master Gracey’s haunted estate . . . you’ll be collecting screems along the way . . . until you reach your final resting place . . . and be among the thousands of ghosts at the Haunted Mansion . . .
Well . . . this game may not be for everyone . . . but it is all in fun . . . recommended for ages 5 to 9 years of age . . . but I don’t know about that. I’d think it is for an older group . . . but that’s just me . . .
You decide what is best for your family and friends . . . I find it fun to make candy boxes for all occasions. Disney has a lovely collection of candy boxes that is sure to please everyone in your family. I’m finding they’re not just for children . . . adults get a kick out of them, too!! Let me see . . . where shall I begin . . . This is a lovely way to ring in spring . . . and Easter . . . maybe for a spring birthday party . 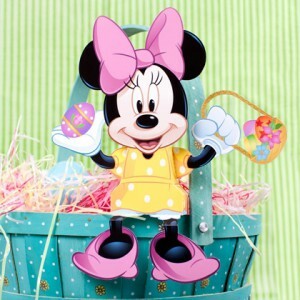 . .
Click the image of Minnie Mouse to be taken to the PDF to download and print. Next we have Daisy Duck . . . She wanted to join in the fun this Easter along with her pal Donald Duck . . . they do make a lovely couple . . .
Oh my! There’s Winnie the Pooh who has also joined us for an outstanding Easter Candy Box . . . 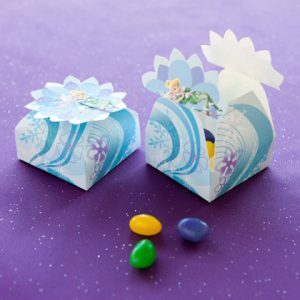 I think from all the candy you purchased from my previous post, these Disney candy boxes will come in handy. You may like to place them in an Easter Basket or display them on a table or the mantle in your home. They are certainly colorful. Maybe Tinker Bell’s Secret Of Wings Gift Box would be more appropriate for your Easter giving. These make lovely hostess gifts you can fill with candy or trinkets. This would be lovely for a spring birthday party . . . you may enjoy showing some Disney videos . . . or maybe playing a Disney game . . . I do wonder what would be a wonderful addition to your Easter and spring celebration . . .
Maybe you would enjoy some other candy . . .
I’m sure I saw some board games . . . I don’t want to get too carried away. Click one of the links and shop around for what you know your family and friends would enjoy for your spring or Easter celebration. You can never go wrong with Mars Chocolate Minis. 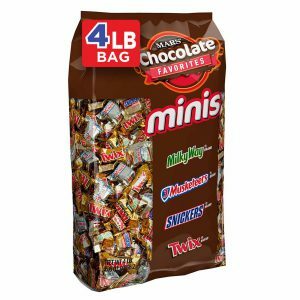 This 240-piece bag of individually wrapped Snickers, Twix, 3 Musketeers and Milky Way mini chocolate candies can be placed in Easter Baskets, plastic eggs and in treat boxes you make to celebrate Easter for your family and friends. And, not to play favorites . . . Nestle has Chocolate Minis as does Hershey . . . The Nestle selection includes an assortment of 100 mini candy bars — Nestlie Milk Chocolate, Baby Ruth, Nestle Crunch and Butterfinger. Contains no artificial flavors or colors and the Butterfinger is gluten free. Hershey’s miniature selection includes: Hershey’s Mikl Chocolate Bars, Hershey’s Special Dark Mildly Sweet Chocolate Bars, Krackel Chocolate Bars and Mr. Goodbar Milk Chocolate Bars. This is a kosher assortment of Hershey’s Chocolate. When it comes to chocolate, the Mars minis is a best seller!! I made my selection . . . I hope you did, too!